In Paris where more than 4,000 went out to the streets, protesters gathered in two locations, forming a joint column and marched towards towards Trocadéro square. Several skirmishes broke out between protesters and police present in large quantities in riot gear. A thick plume of smoke was observed occasionally but it’s not immediately clear what was its source. At least 32 people have been detained in Paris, according to official figures from the city’s police. Authorities say 33,700 demonstrators were out in the streets throughout the country, while protest organizers say over 100,00 people were present. Minor clashes between riot police and the Yellow Vests occurred in the city of Avignon, where protesters were allowed to demonstrate only in one location. Following the brief scuffles, the protest continued peacefully. Police detained 21 people in the city. 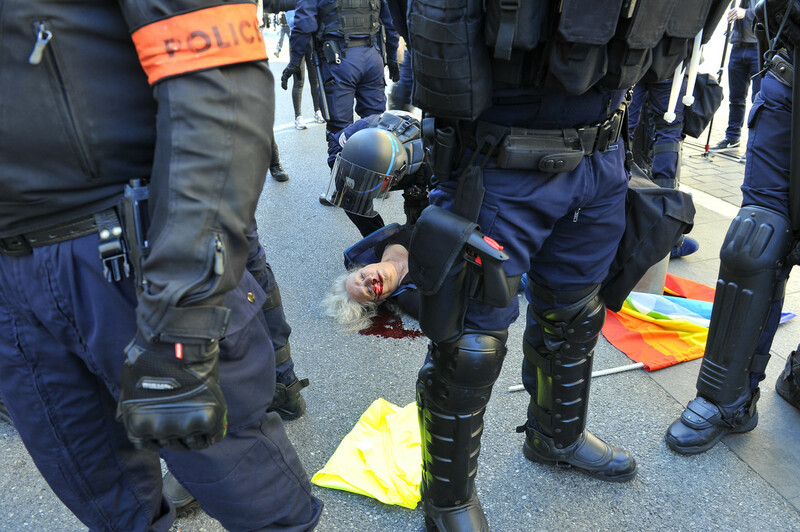 Bordeaux police fired tear gas at protesters in volleys several times throughout the day. Let Macron trade places with Mme. Legay!